The Maryland Terrapins football team represents the University of Maryland, College Park in the sport of American football. The Terrapins compete in the Football Bowl Subdivision (FBS) of the National Collegiate Athletic Association (NCAA) and the Big Ten Conference. The Terrapins joined the Big Ten Conference on July 1, 2014, following 62 years in the Atlantic Coast Conference as a founding member. The Terrapins are currently coached by D.J. Durkin. 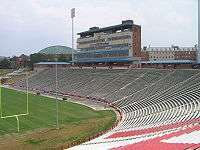 Since 1950, the Terrapins have played their home games at Maryland Stadium in College Park, Maryland with occasional home games from time to time in Baltimore, Maryland, making them one of two FBS football teams in the Baltimore–Washington metropolitan area (Navy Midshipmen) and the closest Football Bowl Subdivision team to Washington, DC. 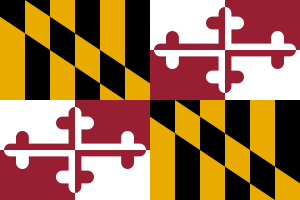 The team's official colors of red, white, black, and gold have been in use in some combination since the 1920s and are taken from Maryland's state flag, and the Terrapins nickname — often abbreviated as "Terps" — was adopted in 1933 after a turtle species native to the state. Maryland shares storied rivalries with Virginia and West Virginia. For year-by-year results, see List of Maryland Terrapins football seasons. 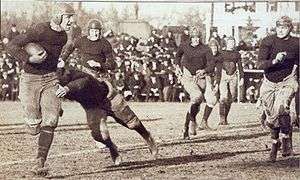 In 1892, the school then known as the Maryland Agricultural College fielded its first officially sanctioned college football team. They went scoreless in all three of that season's games, but the following year, posted a perfect record of 6–0. For the first two decades of the program, the team primarily competed against local universities and high schools due to the prohibitive nature of long-distance travel at the time. After the 1947 season, the Terrapins participated in their first bowl game, the 1948 Gator Bowl, in which they tied Georgia, 20–20. NCAA season-scoring leader Lu Gambino recorded all three Maryland touchdowns. In 1949, Maryland again played in the Gator Bowl, where they defeated 20th-ranked Missouri, 20–7. The Terrapins finished the season ranked 14th by the Associated Press. Maryland's current home field, Maryland Stadium, was constructed in 1950, and named in honor of former coach and contemporary Maryland president Curly Byrd. Maryland started the 1950 season ranked 15th and defeated Navy, 35–21, in the Byrd Stadium dedication game. After Tatum resigned to coach at his own alma mater, North Carolina, Tommy Mont was appointed as his replacement. In his first season, Maryland was riddled with injuries and posted a disappointing 2–7–1 record. Mont had great difficulty recruiting to the same standard that his predecessor had, but managed to secure Rod Breedlove, a highly touted guard prospect. Breedlove later went on to play eight years in the NFL and made a Pro Bowl appearance. In 1957, the Terrapins improved to a 5–5 record. The highlight of the season was a game featuring Jim Tatum's return to College Park, Maryland. On October 19, at Byrd Stadium, Maryland met the North Carolina team led by their former head coach. The game also had in attendance Queen Elizabeth II who had expressed a wish to see her first game of American football. The Tar Heels were ranked 6th in the nation and possessed a 3–1 record. The Terrapins, on the other hand, were 1–3. In the first quarter, Maryland halfback Howard Dare fumbled and North Carolina linebacker Jack Lineberger recovered the ball on the Terrapins' 44-yard line. North Carolina was subsequently forced to punt, but recovered it at the Maryland 35. On the ensuing possession, Tar Heel halfback Daley Goff rushed 11 yards for a touchdown. In the third quarter, Maryland gained excellent field position when Goff received a bad punt snap and the Terps took over on the Carolina 38-yard line. Maryland quarterback Bob Rusevlyan later scored on a one-yard sneak. In the fourth quarter, halfback Ted Kershner broke away for an 81-yard touchdown run. Fullback Jim Joyce capped a 67-yard drive with a 13-yard rush for a score. With a final result of 21–7, the Maryland players carried Mont to the Queen and Prince Philip's box. Mont said it was a day that "I will revel in for the rest of my life." In 1958, however, Maryland again backslided with a 4–6 record and Mont subsequently resigned. At the first practice before the 1959 season, new Terps head football coach Tom Nugent addressed his team, "Hi, I'm Tom Nugent and I hate West Virginia." The Mountaineers were Maryland's first opponent of the season, and Nugent guided the Terrapins to a 27–7 victory in that game. Roger Staubach of Navy tosses a pass against Maryland, 1964. In 1961, Nugent's Maryland team became the first college football program in the nation to put players' names on the back of their jerseys. That season, he led the Terrapins to the best season of his tenure and finished with a 7–3 record. The Terrapins also defeated seventh-ranked Syracuse, 22–21. Nugent amassed a 36–34 record during his tenure at Maryland. He remained the last Maryland coach to win his inaugural game with the team until Ralph Friedgen matched that feat in 2001. Under Nugent, in 1962, Maryland integrated its football team after Darryl Hill caught the eye of Maryland assistant coach Lee Corso. who had been encouraged by Nugent to find a black athlete to play for his team. Hill became not only the first African-American football player at Maryland but the first in the Atlantic Coast Conference and at any college or university in "the old South." In a surprising move, Lou Saban unexpectedly resigned as head coach of the AFL's Buffalo Bills in January 1966 to the head football coach position at Maryland. He said he was leaving because "there can be little left to conquer in professional football". His record at Buffalo was 36–17–3. Saban, however, only stayed at Maryland for one season in which the team posted a 4–6 record, as he departed back to the AFL to become head coach of the Denver Broncos. In 1967, Bob Ward returned to his alma mater to take the head coaching position. Before the season, 12 players failed to academically qualify to play on the team. During that first season, the team lost all nine of their games for the first time in the modern era. Ward's second year saw slight improvement, recording eight losses but with wins over North Carolina and South Carolina. However, many of his players were growing increasingly disgruntled with his coaching style. "I won't go into all the specifics, but it wasn't the good players who started it. It was the guys who couldn't fight their way out of a paper bag, guys who sat on the bench and couldn't take it and a couple of pip-squeak cub newspaper guys who don't know what football's all about ... He gets on the campus newspaper and all of a sudden he's got power he never thought of having." "I don't know who's right or wrong, but ... I don't think it's a good thing for a squad to fire a coach. As an association, we ought to know what happened. If a university fired an English professor because his class didn't like the way he was doing things, I know darn well that the American Association of University Professors would want to know what happened." In 1969, Roy Lester was hired as Maryland's fourth head coach in five years. Lester had previously twice applied for the Maryland head coach position, but didn't get it. The Daytona Beach Morning Journal speculated that Lester's undisclosed salary probably matched that of Ward: $20,000. 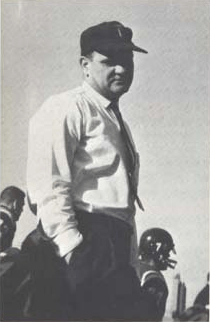 Lester reintroduced the split-T formation at Maryland, which Jim Tatum had used to great effect there in the 1950s. Lester's philosophy was explained by the Maryland sports information director Jack Zane: "the pass should open up the defense for the running game. "In the sixth game of his first season, Maryland's starting quarterback, junior Dennis O'Hara, was injured in a loss at South Carolina, and was replaced by sophomore Jeff Shugars. In the season's penultimate game, Maryland lost to Penn State, 48–0. Penn State halfback Lydell Mitchell had been recruited by Lester and originally intended to go to Maryland before he opted for Penn State instead. Lester was bothered by a similar situation with fullback Franco Harris, whose high school coach was a friend of Lester's. Lester attributed Maryland's football woes to the turnover at head coach and lack of depth because of recruitment shortcomings. Maryland won the finale against Virginia to finish the season with a 3–7 record. In 1970, Lester's Terrapins finished with a 2–9 record. After an upset loss in the season opener against Villanova, 21–3, Lester shuffled the roster. He switched the positions of eight players, which included Tom Miller from fullback to linebacker.The season prior, Miller had gained 629 yards, the second-most ever by a Maryland sophomore. After losing their first five games, Maryland beat South Carolina on Homecoming weekend, 21–15, which prompted Maryland fans to tear down the goalposts in celebration.In the 25-mile per hour winds, the Terrapins capitalized on the Gamecocks' poor punting game, which included one blocked punt. Two weeks later, Maryland was beaten by Clemson, which scored 21 points in the fourth quarter to win, 24–11. With the loss, Maryland slid to a 1–7 record, and Lester said he was giving serious consideration to stepping down before the next season. He said, "If I'm not doing the proper job I'm willing to relinquish the job. I took this loss very personally." In 1971, some observers considered Maryland, which returned 37 lettermen, to be the dark horse in the Atlantic Coast Conference (ACC). Lester said he expected a winning season and that "a lot of people may be surprised." However, the Terrapins dropped the season opener to underdog Villanova once again, 28–13.Star-News called it the most stunning of five upsets in the ACC teams' opening weekend, rating it ahead of NC State's loss to Kent State, Virginia's loss to Navy, South Carolina's win against Georgia Tech, and Duke's win against Florida.Maryland won the following week against NC State, but then dropped five straight before beating the Virginia Military Institute on Homecoming. Maryland closed the season with losses to Penn State, Clemson, and Virginia to again finish with a 2–9 record.Lester was fired at the conclusion of the 1971 season. Athletic director Jim Kehoe cited Maryland's worst record in the ACC for two consecutive years and stated his goal of making Maryland a "nationally ranked caliber" team. Kehoe also said, "financial factors are a serious consideration," and that home game attendance had fallen to its lowest point, which threatened the financial well-being of the athletic department. Lester was replaced by Jerry Claiborne, who later went on to considerable success in the position. In September 1973, Maryland All-American guard Paul Vellano, then playing under Claiborne, said of the past coaches' difficulties: "A lot of the kids said that Ward was a good coach but that he had a lot of bad apples. Lester was a high school coach and nobody had ever heard of him. I can't understand it. We had nine freshman who were All-Americans my first year here under Lester. Maybe if they had let him stay he could have done the job. One of Lester's lasting contributions was the recruitment of future Maryland and NFL star Randy White. 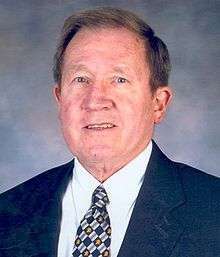 At the end of his tenure, Lester had a combined collegiate coaching record of 7–25. In 1974, Maryland had a preseason rank of 14th and later beat 17th-ranked NC State to win the ACC championship. The Terrapins were defeated by 20th-ranked Tennessee in the Liberty Bowl and finished the season ranked 13th. In 1975, Maryland again won the ACC and defeated 13th-ranked Florida in the Gator Bowl to finish 13th in the nation. That season, the Terrapins led the ACC in total offense with 375.2 yards per game. Maryland started 1976 ranked 12th, and quarterback Mark Manges led them to eleven consecutive wins to secure their third straight ACC championship. Maryland's loss to sixth-ranked Houston in the Cotton Bowl Classic, 30–21, ended any hopes for a national championship. In a surprising choice, former Maryland assistant coach and Citadel head coach Bobby Ross, who was not a big name at the time, was selected as head coach in 1982. In contrast to Claiborne's style, Ross implemented a high-powered offense. He replaced the I-veer triple option with an NFL-style offense that emphasized dropback passes, bootlegs, and play action passes. This change in tactics and strategy enabled starting quarterback Boomer Esiason the opportunity to excel to a degree not seen under Claiborne the season prior. Esiason said, "Ross has an uncanny knack of putting players in a position to not only succeed, but to overachieve . . . If he didn't show up at Maryland, I don't know what would have happened to me. I don't know if I would have turned into the player I was and played in the NFL." In the following years, several Maryland quarterbacks went on to careers in the National Football League (NFL), and the school was nicknamed "Quarterback U" as a result. In 1984, Maryland defeated the defending national champions, sixth-ranked Miami, in what was then the biggest comeback in college football history and judged by some as the most exciting. At half time, Maryland trailed Miami, 31–0. Back-up quarterback Frank Reich replaced Stan Gelbaugh and proceeded to throw four touchdown passes, and capitalizing on Miami errors, the Terrapins won, 42–40. The recovery from the 31-point halftime deficit stood as the greatest college football comeback for the next 22 years, until the record was finally broken by Michigan State against Northwestern. Reich later repeated the feat in his professional career when he led the Buffalo Bills to overcome a 32-point deficit and set the NFL comeback record. That season, Maryland also defeated 17th-ranked West Virginia and 20th-ranked Clemson, and secured the ACC championship. In the postseason, they edged Tennessee, 28–27, in the Sun Bowl and finished 12th in the nation. Maryland entered the 1985 season with a number-one preseason rank, and set its all-time home attendance record in Byrd Stadium with an average of 49,385 over five games. However, they dropped to a ranking of 17th in Week 2, and then out of the polls in Week 4 after a shutout by Michigan. Despite the early setbacks, the Terrapins finished undefeated in six conference games to take the ACC championship for the third consecutive year. Maryland defeated Syracuse, 35-18, in the Cherry Bowl and earned a final ranking of 18th. In 1986, the Terrapins posted a mediocre 5–5–1 record. Maryland athletics in general were marred by the death of Len Bias, and the football team was no exception. After Ross resigned, offensive coordinator and quarterbacks coach Joe Krivak was promoted to head coach. This was the beginning of a lackluster period for Terrapins football. From 1987 to 2000, the Terrapins went 55–88 overall (.385) with only two winning seasons and one bowl appearance. The Krivak era was met with a brutal schedule with non-conference opponents consisting of national powers Michigan, Miami, Penn State, and Syracuse among others. After a 4-7 season in 1987, a controversial loss to Virginia in the final game of 1988 cost the team a sixth win for bowl eligibility. In 1989, Maryland tied Joe Paterno's 13th-ranked Penn State. existence. The following season, the Terrapins beat 25th-ranked West Virginia and upset 8th-ranked Virginia. Maryland received a bid to the Independence Bowl and tied Louisiana Tech in what would be their only postseason appearance during this period. 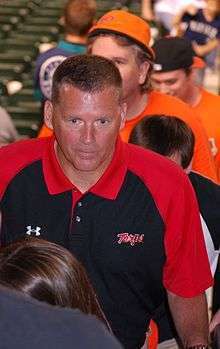 Athletic director Andy Geiger rewarded Krivak with a five-year contract extension, but the 1991 season unraveled after a rash of injuries, and Maryland had its worst finish in two decades with a 2–9 mark. After public criticism from several players, Krivak felt he lost credibility as the head coach and resigned on December 6. Geiger named Holy Cross head coach Mark Duffner as Krivak's replacement. Duffner had amassed a 60–5–1 record and two undefeated seasons in his six years at Holy Cross. At Maryland, he installed a run and shoot offense which shattered many school records. However, his defenses were notoriously weak, usually giving up points so quickly that even his prolific offense couldn't keep up. For example, in the 1993 game against Virginia Tech, the Terrapins lost by 27 points despite gaining 649 yards of total offense. During this time, quarterbacks Scott Milanovich and John Kaleo set numerous school records for passing under Duffner, most of which still stand. In 1993, Maryland earned the dubious honor of most yards allowed per game, a record which also stands: in eleven games, the Terrapins surrendered 6,083 yards—an average of 553.0 yards per game. Maryland also gave up 236 more points than they scored, the worst point differential in school history. After the season, Duffner reorganized his staff by firing three assistant coaches. The team showed moderate improvement the next two years, and in 1995 finished 6–5, which was the first winning record since 1990. However, Maryland backslid in 1996 with a 5–6 record and a struggling offense. Duffner was fired after the season, having accumulated a combined record of 20–35. Ron Vanderlinden was hired as head coach for the 1997 season under a five-year contract. Vanderlinden had helped engineer turnarounds at Northwestern as defensive coordinator and at Colorado as a defensive assistant. The 1995 Northwestern team in particular had shocked observers when it recorded a 10–2 season and the Big Ten championship. In 1999, Maryland showed signs of significant improvement, and a winning season appeared certain when Maryland possessed a 5–2 record. The Terrapins, however, then suffered a three-game losing streak. In their finale against Virginia, the Terrapins needed a win to garner a likely invitation to either the Aloha Bowl or Oahu Bowl—a Maryland alumnus was the chief executive officer of both events. The Terrapins came from behind and held the lead, 30–27, with 5:18 left to play. They regained possession with 1:40 remaining, but an inexperienced quarterback unintentionally stopped the clock by going out of bounds. After the ensuing punt, Virginia mounted a touchdown drive to win the game and end Maryland's bowl hopes. Despite narrowly missing a winning season, Vanderlinden was granted a two-year contract extension. In 2000, Maryland again fell short of a winning season and bowl game. The Terrapins entered their season closer with a 5–5 record, and again fell, this time in a rout by 24th-ranked Georgia Tech. Vanderlinden was fired the following day. Despite the failure to deliver a winning season, Vanderlinden did oversee substantive improvement in the program. In 1998, the Terrapins were one of the most improved teams in defense, scoring defense, passing defense, and rushing. In 1999, Maryland allowed a conference low of 11 sacks compared with 56 in 1997. In that same period, Maryland also improved from last to first in the conference in rushing, due in large part to Heisman Trophy candidate and school career rushing leader LaMont Jordan. During Vanderlinden's tenure, Maryland also recruited several key players who were instrumental in the team's later success. On December 2, 2015, the Terps announced that former Michigan defensive coordinator D. J. Durkin will be named the new head coach. In 1950, that small field was replaced by the identically named but much larger Byrd Stadium, which was constructed at the cost of $1 million. The new stadium had an initial capacity of 34,680, which has since been upgraded to 51,055 through extensive additions. Shortly after its construction, the stadium hosted its dedication game against Navy, which Maryland won 35–21. That same year, the new field held its first and only bowl game, the Presidential Cup Bowl, which featured Texas A&M and Georgia. In 2006, the University of Maryland became the first school to sell naming rights to its field. The home field was officially branded "Chevy Chase Bank Field at Byrd Stadium" in a 25-year, $20 million contract. In 2008, Chevy Chase Bank was bought out by Capital One, and the stadium was renamed Capital One Field at Byrd Stadium. On December 11, 2015, the Board of Regents voted 12-5 to remove the "Byrd" from the stadium's name because of Harry "Curley" Byrd's segregationist history, renaming it Maryland Stadium for the time being. A cannon furnished by the Mighty Sound of Maryland is fired to signify that the Terrapins have scored. This tradition has been in place since 1960. Also, the cannon is fired before the game to let the tailgaters know that the game is about to start. West Virginia has often been called Maryland's biggest rival, and the teams have met 51 times since their first game in 1919. The Maryland-West Virginia rivalry had a chance of becoming an annual game with West Virginia potentially joining the ACC in 2012, but the Mountaineers wound up joining the Big 12 Conference. In 2001, both programs hired new head coaches, with West Virginia being taken over by Rich Rodriguez. Due to their proximity, the schools regularly raid their opponent's recruiting areas. The long-running series was put on hiatus for the 2008 and 2009 seasons, but resumed in 2010. Maryland and Penn State have met 39 times since the 1917 season. Although Penn State leads the series with a lopsided 36-2-1 record against Maryland, many of those games were decided by field goals and turnovers. Because Maryland was in the ACC before joining the Big 10 Conference in July 2014, this rivalry was mainly kept alive through recruiting. The teams seldom played each other while Maryland was in the ACC but they competed in recruiting in the Baltimore-Washington metropolitan area and Delaware Valley. The teams met in State College on November 1st 2014 for the first time in 11 years. Maryland defeated Penn State 20-19, and at the conclusion of the game, Randy Edsall finished his interview by saying "You know what? Let the rivalry begin". The following year, the rivalry game was played at M&T Bank Stadium in Baltimore, Penn State defeated Maryland 31-30. Most recently, the Terrapins lost in a blowout in State College on October 8, 2016. After staying close for most of the first half, the Nittany Lions shut Maryland out in the final 30 minutes to cruise to a 38-14 win. The Maryland-Virginia rivalry was a designated official ACC cross-divisional series when Maryland was an ACC member and the teams have a long-standing rivalry due to proximity and history. The programs also vie for recruits in the same region, and more recently, an additional factor has been the schools' academic competition. Maryland and Virginia have occasionally served as spoilers for one another by precluding a championship or bowl game appearance. Since Maryland is moving out of the ACC and into the Big Ten, the future of this series is in question. 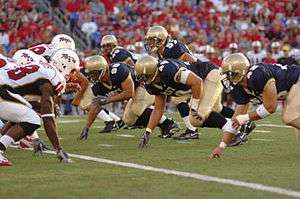 Maryland played the Naval Academy, which is also located in the state of Maryland, several times between the 1930s and 1960s. The rivalry is known as the Crab Bowl Classic. In 1964, an incident in which a Terrapins player flashed an obscene gesture prompted Navy officials to suspend the series for 40 years. They finally played again in 2005. As of 2010, the winner of the Crab Bowl Classic is awarded the Crab Bowl Trophy. Below are Maryland's record against its top ten most-played opponents. Below are Maryland's all-time record against current Big Ten opponents. ↑ University of Maryland Visual Identity Guide (PDF). 2016-03-24. Retrieved 2016-03-24. 1 2 3 4 Past Division I Football Bowl Subdivision (Division I FBS) National Champions, National Collegiate Athletic Association, retrieved December 1, 2008. ↑ David Ungrady, Tales from the Maryland Terrapins, p. 4, Sports Publishing LLC, 2003, ISBN 1-58261-688-4. ↑ New College Body Planned in South, The New York Times, December 12, 1920. ↑ 2008 Maryland Terrapins Football Media Guide (PDF), University of Maryland, 2008, accessed December 9, 2008. 1 2 3 4 5 6 7 8 9 10 11 12 13 14 15 16 17 18 19 20 21 22 23 24 25 26 27 28 29 30 31 32 Year-by-Year Results (PDF), 2008 Maryland Terrapins Football Media Guide, University of Maryland, 2008. ↑ Clark Shaughnessy, College Football Hall of Fame, retrieved December 15, 2008. ↑ B.J. Phillips and Peter Ainslie, Football's Supercoach, Time, p. 4, September 29, 1980. ↑ Gary King, The Forgotten Man of Oklahoma Football: Jim Tatum, Sooner Magazine, University of Oklahoma Foundation, Inc., Spring 2008, retrieved December 17, 2008. ↑ Records (PDF), 2007 Maryland Football Media Guide, University of Maryland, p. 55, 2007. ↑ 1992 - Lu Gambino, Gator Bowl Hall of Fame, retrieved December 23, 2008. ↑ 2007 NCAA Division I Football Records Book (PDF), National Collegiate Athletic Association, retrieved December 5, 2008. ↑ 1940s, Maryland Football Historical Timeline, Maryland Gridiron Network, retrieved January 8, 2008. 1 2 Facilities: Chevy Chase Bank Field at Byrd Stadium, University of Maryland, retrieved January 8, 2008. ↑ Vic Gold, The Greatest Game, Washingtonian, January 1, 2002. ↑ The Coach, Time, August 3, 1959. ↑ Text from Page 54, Reveille, University of Maryland Yearbook, p. 54, 1959, retrieved January 28, 2009. 1 2 3 Year-By-Year Results (PDF), 2007 Terrapin Football Record Book, University of Maryland, 2007, retrieved 16 January 2009. 1 2 3 4 5 6 Atlantic Coast Conference, Sports Illustrated, September 23, 1957. ↑ K. Adam Powell and Woody Durham, Border Wars: The First Fifty Years of Atlantic Coast Conference Football, 2004, Scarecrow Press, ISBN 0-8108-4839-2. 1 2 Maryland's queen for a day, The Washington Times, October 19, 2007, retrieved January 28, 2009. ↑ Bob Boyles and Paul Guido, 50 Years of College Football: A Modern History of America's Most Colorful Sport, 2007, Skyhorse Publishing Inc., ISBN 1-60239-090-8. 1 2 3 4 Bill Free, Ex-Terps coach Nugent dies, The Baltimore Sun, January 20, 2006. ↑ Dan Steinberg, When Maryland football first put players names on jerseys, The Washington Post, August 2, 2011. ↑ Thomas N. "Tom" Nugent Records by Year, College Football Data Warehouse, retrieved August 23, 2010. ↑ Maryland Shocks UNC, The Orlando Sentinel, September 2, 2001. ↑ "Well-traveled coach Lou Saban dies at age 87 - ESPN". Sports.espn.go.com. 2009-03-29. Retrieved 2014-08-20. ↑ "Lou Saban Resigns". The Montreal Gazette. Buffalo, N.Y. Associated Press. January 3, 1966. p. 25. Retrieved August 10, 2012. ↑ "Lou Saban Record, Statistics, and Category Ranks". Pro-Football-Reference.com. Archived from the original on October 7, 2012. Retrieved August 10, 2012. ↑ "Lou Saban Coaching Record | College Football at". Sports-reference.com. Retrieved 2014-08-20. ↑ "Denver Broncos Offer Lou Saban 10-Year Contract to Coach AFL Club". Youngstown Vindicator. Denver. Associated Press. December 16, 1966. p. 23. Retrieved August 10, 2012. ↑ "Bob Ward Maryland Football | Robert Ward, 77, coach, football player at UM - Baltimore Sun". Articles.baltimoresun.com. 2005-05-03. Retrieved 2014-08-20. ↑ They Said It, Sports Illustrated, July 17, 1967. ↑ "1967 Maryland Terrapins Stats | College Football at". Sports-reference.com. Retrieved 2014-08-20. ↑ Lester Named Maryland Grid Coach, The Daytona Beach Morning Journal, March 15, 1969. ↑ Lester Keeps the Big Ones Penned Up, The Herald-Journal, October 30, 1969. ↑ Maryland Way Down, Coach Says, The Pittsburgh Press, November 14, 1969. ↑ 8 Players Switched By Lester, The Herald-Journal, September 16, 1970. ↑ On Loss To Maryland; Leheup: They Deserved It, The Herald-Journal, October 18, 1970. ↑ Low-Ebb Lester: It's Not Kids' Fault But Mine, The Herald-Journal, November 1, 1970. ↑ No Way To Explain Losses, The Star-News, September 13, 1971. ↑ Terp Coach Expecting Big Season, The Schenectady Gazette, September 8, 1971. ↑ Maryland Fires Head Grid Coach, The Tuscaloosa News, December 5, 1971. ↑ Claiborne Wants To Forget Past, Reading Eagle, December 17, 1971. ↑ Terps' Vellano Wants Bowl Bid, The Herald-Journal, September 5, 1973. ↑ Pine Has Rich Grid Background, The Gardsen Times, October 25, 1981. ↑ Roy Lester, College Football Data Warehouse, retrieved February 9, 2009. 1 2 David Ungrady, p. 210. ↑ ACC Year-by-Year (PDF), 2007 Atlantic Coast Conference Media Guide, Atlantic Coast Conference, 2007. ↑ Cotton Bowl Foes Arrive, The New York Times, December 27, 1976. ↑ Herbert Sparrow, Claiborne seeks return to Kentucky glory days, The Free-Lance Star, December 17, 1981. 1 2 3 Justin Rodriguez, Champion of the underdog, Times Herald-Record, August 8, 2004. ↑ Quarterback U, Sports Illustrated, November 25, 1991. ↑ Ken Murray, Ex-Maryland Qbs Not A Passing Fancy, The Seattle Times, January 9, 1993. ↑ Jim Sumner, Looking Back... The 1982 Clemson at Maryland Game: A Game Worthy of Championship Status, Atlantic Coast Conference, October 24, 2007. ↑ Daniel Taylor, '83 Maryland game was a crucial win, The Tiger, November 30, 2007. ↑ This Day in History November 10, 1984: Maryland gets a miracle in Miami, The History Channel, retrieved September 6, 2009. ↑ The greatest comeback?, The Baltimore Sun, October 2007. ↑ Spartans stun Cats for biggest comeback in I-A history, ESPN, October 12, 2006, retrieved December 16, 2008. ↑ College football's best of the last 20 years, USA Today, November 19, 2002. ↑ 1980s, Maryland Football Historical Timeline, Maryland Gridiron Network, retrieved January 8, 2008. 1 2 3 Ross to Leave Maryland, The New York Times, December 2, 1986. 1 2 3 Maryland's coaching exodus claims Ross, Boca Raton News, December 1, 1986. ↑ College Football: South; Virginia, at Last, Defeats Maryland, The New York Times, November 20, 1988. 1 2 Maryland lures Duffner away from Holy Cross, The Boston Globe, January 1, 1992. ↑ Steve Berkowitz, With Injury Report, Terps Find Truth Hurts, The Washington Post, p. C12, October 14, 1991. ↑ Krivak Resigns as Maryland Football Coach; Says Credibility Hurt by Remarks, The Washington Post, December 7, 1991. 1 2 Clock Runs Down for Duffner, The Washington Post, November 21, 1996. ↑ Defense holds the key to Terrapins' success, The Free Lance-Star, August 28, 1996. ↑ College Football, Sports Illustrated, October 2, 1995. ↑ 2007 NCAA Division I Football Records Book (PDF), National Collegiate Athletic Association, 2007. ↑ Maryland yearly totals. College Football Data Warehouse, retrieved August 28, 2010. ↑ Offseason Upheaval for Terps; Duffner Overhauling Football Staff After 2-9 Year, The Washington Post, January 4, 1994. ↑ Veteran Terps dare to dream Preview: Sixteen returning starters should make Maryland a force in the ACC, The Baltimore Sun, August 11, 1996. ↑ Cummings shoots from lip, heart Keeping emotions under control No. 1 task for Terps' QB, The Sun, September 5, 1997. ↑ Maryland Coaching Records, College Football Data Warehouse, retrieved July 23, 2009. ↑ Season of Reckoning Descends Upon Coach, The Washington Post, p. G05, September 2, 1999. ↑ THE MAESTROS; At Colorado and Northwestern, he helped teams come into their own. Now he's on his own, as a head coach, The Washington Post, p. H03, August 29, 1997. ↑ The 1995 Northwestern Wildcats go to the Rose Bowl, The Chicago Tribune, January 1, 1996. ↑ Skidding Terrapins Hit Crossroads, The Washington Post, p. D02, October 17, 2000. ↑ QB, DB questions remain as Terps build toward 2000 season, The Washington Times, November 22, 1999. ↑ A Bad Way To End A Good Effort, The Washington Post, November 21, 1999. ↑ Josh Barr, Terps' Vanderlinden Signs Through 2003, The Washington Post, December 21, 1999. ↑ Missouri fires Smith as coach, Milwaukee Journal Sentinel, November 20, 2000. 1 2 Ron Vanderlinden, University of Maryland, retrieved July 24, 2009. ↑ Rushing Records, University of Maryland, retrieved May 10, 2010. ↑ Smells Like Team Spirit, Baltimore City Paper, October 17, 2001. ↑ Terps Roots Run Deep; Friedgen Returns Home to U-Md, The Washington Post, p. D01, December 27, 2000. ↑ 'El Supremo': After 33 years as a successful assistant, Ralph Friedgen finally in charge at his alma mater, The Washington Times, August 29, 2001. ↑ Kelli Anderson, Wise Guides: Plotting, scheming and motivating behind the scenes, these sideline sages are the best at preparing their teams, Sports Illustrated, August 11, 2003. ↑ No. 22 Terrapins Top Tech In Overtime, Atlantic Coast Conference, October 11, 2001. ↑ Maryland vs. Florida State, USA Today, October 27, 2001. ↑ 'Unbelievable'; Hill's Late Touchdown Pass to Gary Gives Maryland ACC Championship, Berth in Top-Flight Bowl Game, The Washington Post, p. D01, November 18, 2001. ↑ Terps Bowled Over by Gators; Maryland's Uplifting Season Ends With Orange Bowl Defeat, 56-23, The Washington Post, p. A01, January 3, 2002. ↑ Losers, and Still Champions; Seminoles Back Into ACC Title Despite Second Straight Loss to Wolfpack, The Washington Post, p. D17, November 24, 2002. ↑ Maryland Football Finishes No. 3 In New York Times Computer Ranking, University of Maryland, January 6, 2004. 1 2 3 Rick Snider, Ill will lingers at Navy, Maryland; Rivalry to restart in Crab Bowl, The Washington Times, p. 1, August 29, 2005. ↑ Maryland's football season was one of determined resilience and unrealized promise. Tonight's Emerald Bowl will decide whether it will be remembered as a winning season, The Washington Post, December 28, 2007. ↑ Turner's trip from underdog to top dog, The Baltimore Sun, December 25, 2007. ↑ Going nowhere fast: Wolfpack fizzles in finale, The Burlington Times-News, November 25, 2007. ↑ Oregon State runs roughshod over Maryland, The Columbus Dispatch, December 29, 2007. ↑ Jeff Sagarin NCAA football ratings, USA Today, January 8, 2008. ↑ Scott Arrives, Right on Time, The Washington Post, December 31, 2008. 1 2 Phil Steele, Phil Steele's 2009 College Football Preview, Volume 15, p. 118, Summer 2009. ↑ Patrick Stevens, Mags' look at Maryland, The Washington Times, June 12, 2009. ↑ BC finishes 8-4, sends Maryland to seventh straight loss, ESPN, November 28, 2009. ↑ UMD Football Fans Say Goodbye to Coach Friedgen NBC Washington, December 29, 2010. ↑ Expanded Top 25, Rivals, January 11, 2011. ↑ Maryland's O'Brien Named ACC Rookie of the Year; Florida State's Xavier Rhodes garners defensive newcomer honors., Atlantic Coast Conference, November 30, 2010. ↑ Bottom line and red ink foil Friedgen, The Washington Post, December 21, 2010. ↑ "Coach Randy Edsall of Connecticut Huskies hired by Maryland Terrapins - ESPN". Sports.espn.go.com. 2011-01-03. Retrieved 2014-08-20. ↑ Whiteside, Kelly (6 September 2011). "Fear the helmet: Maryland's new uniforms draw attention". USA Today. Retrieved 6 July 2012. ↑ Sharrow, Ryan (2 September 2008). "Under Armour to outfit University of Maryland with $17.5M deal". Washington Business Journal. Retrieved 6 July 2012. ↑ "Maryland Terrapins hire ex-New Mexico Lobos coach Mike Locksley to run offense - ESPN". Espn.go.com. 2011-12-22. Retrieved 2014-08-20. ↑ Dinich, Heather (13 January 2012). "Todd Bradford out as Maryland's D-boss". ESPN. Retrieved 6 July 2012. ↑ Dinich, Heather (22 December 2011). "Mike Locksley hired at Maryland". ESPN. Retrieved 6 July 2012. ↑ "Stewart Hired as Defensive Coordinator". University of Maryland. 17 January 2012. Retrieved 6 July 2012. ↑ Prewitt, Alex (October 31, 2012). "Maryland is down to a linebacker and a tight end as its top two quarterbacks". The Washington Post. Retrieved 1 December 2014. ↑ "2012 Maryland Terrapins Football Schedule". Fbschedules.com. 2012-10-08. Retrieved 2014-08-20. ↑ "2013 Maryland Terrapins Football Schedule". Fbschedules.com. 2012-10-08. Retrieved 2014-08-20. ↑ "Marshall Thundering Herd vs. Maryland Terrapins - Recap - December 27, 2013 - ESPN". Scores.espn.go.com. 2013-12-27. Retrieved 2014-08-20. ↑ "Edsall Relieved of Coaching Duties - Maryland Terrapins Athletics - University of Maryland Terps Official Athletic Site". Umterps.com. Retrieved 2015-10-11. ↑ Schad, Joe. "Source: D.J. Durkin to coach Maryland Terrapins". espn.go.com. ESPN. Retrieved 2 December 2015. ↑ Martie Zad, A Majestic Century: Maryland Football Celebrates 100th Birthday, The Washington Post, August 30, 1992. ↑ Alex Baldinger, Athletic Evolution, The Diamondback, December 10, 2005. ↑ Chevy Chase Bank Field at Byrd Stadium, University of Maryland, retrieved July 24, 2009. ↑ Dan Daly, Getting bowled over by love, The Washington Times, December 8, 2002. ↑ Jim Bentubo, Colleges Forgoing Millions In Naming-Rights Deals, Sports Business Daily, August 31, 2007. ↑ Jessica Collins, UM: Chevy Chase Bank deal won't impact stadium naming rights, Baltimore Business Journal, December 5, 2008. ↑ Capital One Field at Byrd Stadium, University of Maryland, retrieved February 26, 2010. ↑ Wenger, Yvonne (December 11, 2015). "Byrd Stadium to become Maryland Stadium after regents vote". BaltimoreSun.com. The Baltimore Sun. Retrieved December 11, 2015. 1 2 3 4 Testudo: Tale of the Top Shell, University of Maryland, retrieved August 20, 2011. ↑ YALE MEN PRAISE MARYLAND ELEVEN; Hope to Feature Game With Orioles in 1924, Calling Them Fine Sportsmen, The New York Times, November 12, 1923. ↑ FOOTBALL SEASON SET NEW RECORDS; All Attendance Marks Were Broken and the Sport Had Its Greatest Year, The New York Times, December 2, 1923. ↑ YALE VICTOR, 16-14, AFTER UPHILL FIGHT; Touchdown by Stevens in Third Period Wrests Victory From Maryland Eleven, The New York Times, November 11, 1923. ↑ Reveille, University of Maryland Yearbook, Class of 1928, p. 182, 1928. ↑ Visual Identity Guide (PDF), p. 16, University of Maryland, retrieved August 20, 2011. ↑ All About Testudo, University of Maryland, retrieved July 24, 2009. ↑ Michael MacCambridge (ed. ), ESPN College Football Encyclopedia: The Complete History of the Game, pp. 464–467, ESPN, 2005, ISBN 1-4013-3703-1. 1 2 Maryland Colors: Red, White, Black, and Gold, University of Maryland, retrieved December 5, 2008. 1 2 Vanderlinden Era Begins; Terps Play Host to Ohio University, University of Maryland, September 1, 1997. ↑ Paul Attner, The Terrapins: Maryland Football, p. 258, 1975, Strode Publishers, ISBN 0-87397-066-7. ↑ Megan Eckstein, Group aims to coordinate school spirit, The Diamondback, October 10, 2005. ↑ Jeff Amoros, Athletics announces blackout, The Diamondback, September 13, 2007. 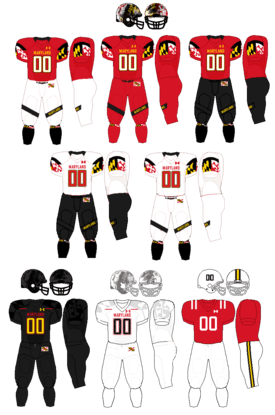 ↑ Maryland unveils new football uniforms, The Washington Post, August 22, 2011. ↑ Maryland new football uniforms on CNN, PTI, The Washington Post, September 7, 2011. ↑ Marc Craig, One for the Border, The Washington Post, September 13, 2007. ↑ Scott Grayson, Mountaineer Minute: Part 1, 12 News, WBOY-TV, September 13, 2007. ↑ Mark Schlabach, Rivalries, rematches and revenge top 2007's best matchups, ESPN, July 5, 2007. ↑ Jeff Barker, Even counting Virginia, Terrapins are unrivaled, The Baltimore Sun, October 3, 2008. ↑ Doug Doughty, Cavs, Terrapins a textbook rivalry, The Roanoke Times, November 14, 2003. ↑ Eric Prisbell, No Common Ground; They Battle for Position in the ACC. They Compete for Recruits. Most of All, Maryland and Virginia Fight Just to Beat Each Other, The Washington Post, November 13, 2003. ↑ "Crab Bowl Trophy". 28 August 2010. The Capital website. Retrieved 29 August 2010. 1 2 "Maryland Head-to-Head Results". Sports-Reference.com. Retrieved 3 September 2016. ↑ The Winning Margin: Year By Year, Heisman.com, retrieved June 9, 2009. ↑ 1953 - 19th Award, Heisman.com, retrieved June 9, 2009. ↑ 1955 - 21st Award, Heisman.com, retrieved June 9, 2009. ↑ 1961 - 27th Award, Heisman.com, retrieved June 9, 2009. ↑ 1974 & 1975 - 40th & 41st Awards, Heisman.com, retrieved June 9, 2009. ↑ 1983 - 49th Award, Heisman.com, retrieved June 9, 2009. ↑ FBSchedules.com, . Retrieved August 2, 2014.